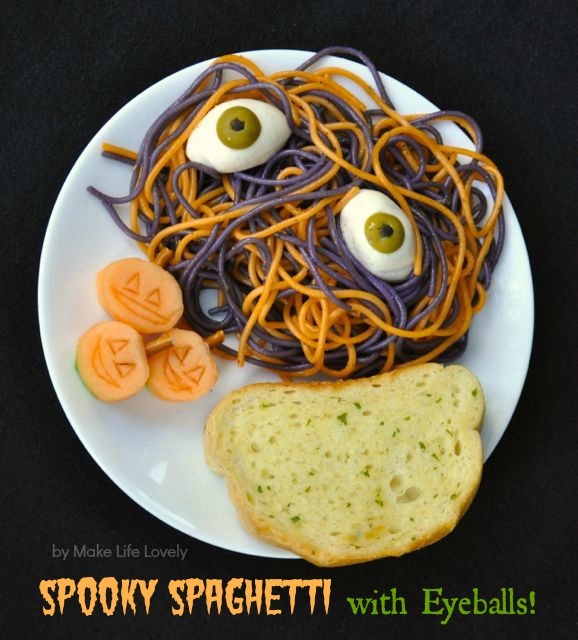 I am thrilled to be sharing this easy spooky spaghetti with eyeballs dinner recipe with you, perfect for fall and Halloween! It was so easy to make and a whole lot of fun! What child can resist a big plate of colorful pasta with eyeballs staring right back at them? And what adult can resist how easy this dinner is to throw together? I’ll show you how easy it is to make this fun pasta recipe for your family. Boil two large pots of water on the stove. Once the water reaches a boil, add half of the package of spaghettini to each pot, along with a dash of salt. Add about 1/4 tsp. of orange food coloring to one pot, and 1/4 tsp. of purple food coloring to the other pot. Boil to desired tenderness, 8-10 minutes, stirring occasionally. Drain pasta in a colander. Step 1. For each eyeball, cut a small slice off the end of a green olive. Poke a drinking straw through middle of the green olive slice, and remove the center, so there is a hole in the middle. Poke a hole through a black olive slice, and insert the cut out black olive circle into the green olive hole. Step 2. Cut a thin slice of cheese off of the top of the mozzerella ball, so that the olives can lie somewhat flat. Stick both olive pieces onto the top middle of the mozzerella cheese ball. The olives stick surpisingly well to the mozzerella cheese- I turned my eyeballs upside down, and those olives didn’t slip at all! Step 1. Combine 1/4 cup + 1 Tbsp. olive oil, 1/2 tsp. Italian seasoning, 1/4 tsp. granulated garlic, and salt and pepper (to taste). Mix, and add sauce to both colors of pasta in a big bowl. Step 2. 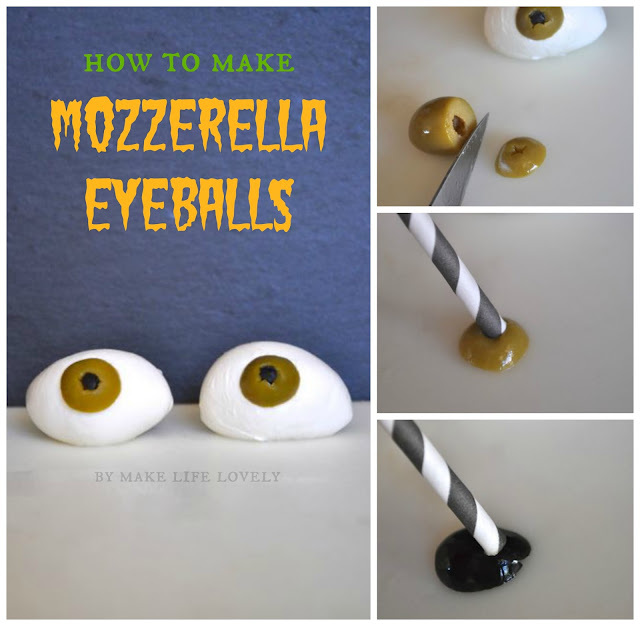 Add the eyeballs to the top of the pasta, and surprise your kids!! 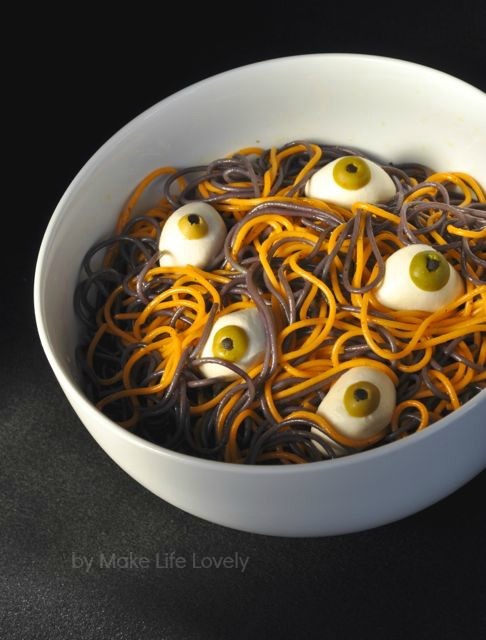 I served my four kids their spooky spaghetti with eyeballs with garlic toast. YUM! I also made some cute little pumpkins that I cut from cantaloupe,and turned into tasty jack o’ lanterns, complete with a little pretzel stem! I hope you enjoy this fun meal as much as we did! This would be the perfect dinner to feed your little ones this fall or on Halloween night, and guests would love it at a Halloween party or dinner party with friends! If you liked this project, follow me on Facebook, Twitter, Pinterest, Bloglovin’, and Instagram for more inspiration! I am dying over this recipe and how to. I HAVE to do this for my family this Halloween! Yes, you should, they’ll think you’re the coolest mom ever! And it’s soooo easy to make! This is an awesome recipe. I want to make it for my kids! This is insanely cute!! I usually order a pizza on Halloween but I’m going to plan a spooky dinner just so I can make this! I shared this over on my blog in my Friday Finds so glad I came across it on Pinterest! I’m so glad you’re going to make this! They eyeballs are my favorite part, they end up looking so real. Thanks so much for sharing on your blog- I’m off to check it out!! My kiddos are going to have a hoot with this! We didn’t get the lemonade stand done this summer (it’s now snowing) but I’m going grocery shopping and can’t wait to pick up stuff for this! Awesome! Such a cute, awesome idea, how did you ever come up with it? Love this idea. Just pinned it! What an awesome idea–I cannot wait to make this for my family! Thanks for sharing the recipe and idea! This is so cute and clever! I would have loved to make this for my kids when they were little. SUPER FUN AND SUPER COOL! I cannot wait to make this for my kids this Halloween! Thanks for the awesome recipe!! So creative!! Does the dye on the pasta rub off on hands?? I have dyed pasta with food coloring after if was already cooked but never while it was cooking. my daughter used this idea for her halloween sleepover her and her friends loved it it is such a good idea!!! 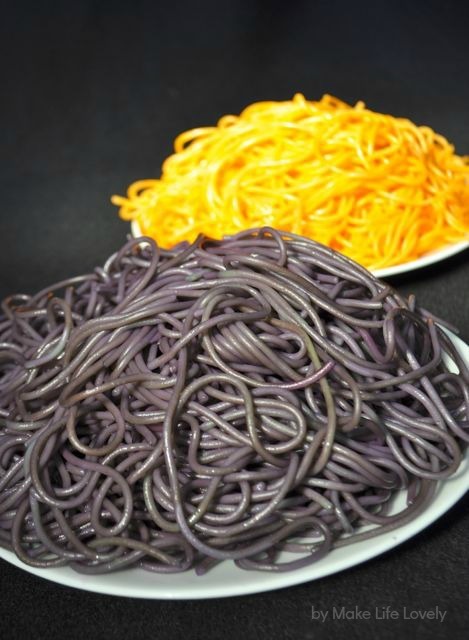 I tried this recipe but the pasta wouldn’t change colour! Any ideas why? I’m using standard dry spaghetti pasta and black gel food colouring. Really? How strange, it works perfectly for me. Did you wait until the water was boiling to add the gel color after you added the spaghetti? Did you add the full amount of gel coloring to the pasta, and make sure to stir in in really well to distribute the color? Dous it stain your mouth?